The answer is, "Yes, you can!" Grab your children by the hand. It's time to explore our world throughout history. Let's take a map trek! This NEW, Hot-Off-The-Press CD-ROM contains 53 historical maps, 50 state maps, 3 U.S. maps in different sizes, and 106 student maps. Would you like to take a look for yourself? 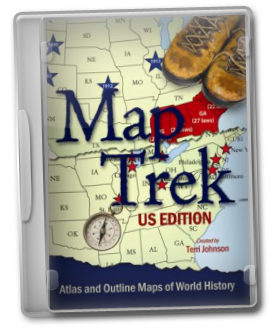 Download the FREE Map Trek U.S. Sampler here. 1. A full color teacher's answer map that will help you tremendously. 2. An unlabeled student map for your child to color in and label. There is a slight color shading on the ocean/water areas to help your child determine which parts of the map are land and which are water. BUT the shading is minimal so as to not interfere with his creative coloring process OR to use much ink when printing from your printer. 3. Lesson Plans to help you know what to assign to each of your children at their various stages of learning. There are lesson plans included for all 50+ outline maps and are broken down into 3 levels - Level A (grades 1-4), Level B (grades 5-8) and Level C (grades 9-12). 106 Full-color teacher answer maps. 106 Blank outline maps for the student. 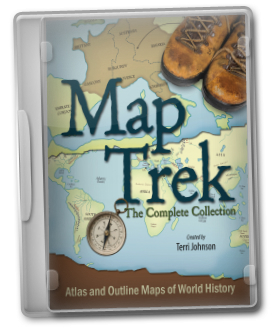 To view the full Table of Contents, please download the US Map Trek Sampler above for complete map listing. This CD-ROM is PC and Mac compatible. Let us know if you have any other questions - helpdesk@kqpublishing.net. Prefer the ebook to get it today AND save on shipping costs? Buy both CD-ROMs and Save $10! Looking for Medieval World Map Trek ebook? Click here.